Custom Beverage is proud to introduce our newest Custom Dispensing System! 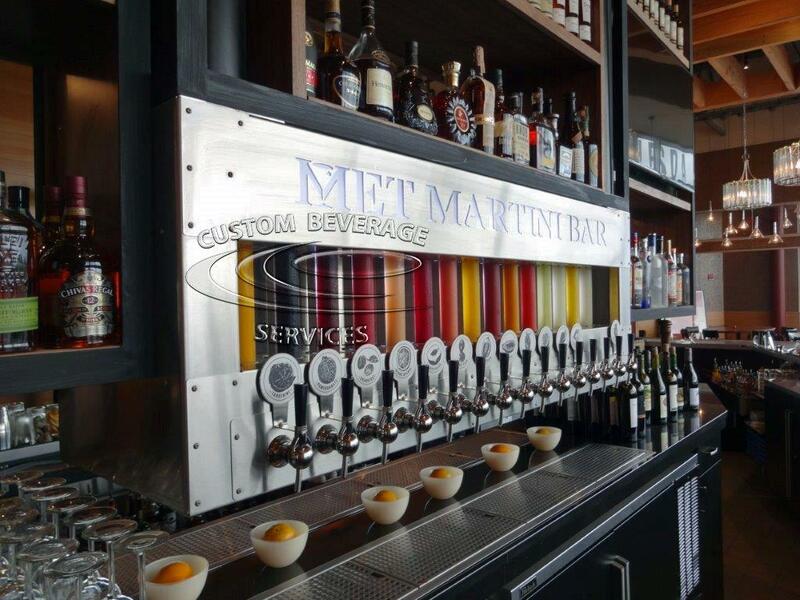 Boston based, The Met Restaurant Group, asked if it would be possible to create a unique dispensing system for their fresh purees and juices that are used for flavoring their signature and exotic craft cocktails. This would become a focal point at their newest concept Met Bethesda, serving the Greater Washington D.C. area. We were up for the challenge! After several months of design engineering and custom fabrication, we were able to produce a dispenser that is not only functional but has a stunning visual display of the product being dispensed! The dispenser itself is double sided to include 30-taps and features stainless steel construction, glycol cooled product display tubes and LED backlighting. While on site, we also installed their remote, glycol cooled, draft beer system that includes two 6-Faucet Metro T Towers with coordinating drainers. Back in the cooler, we installed custom regulator panels outfitted with FOBs & sankey keg couplers.